our trip so far has been absolutely wonderful...and i'm a little bit in constant awe at how lovely california is! the mountains have stolen my heart. as well as in and out burger. so far we've visited the santa monica pier and malibu...the ocean here is just beautiful! i didn't expect to notice a difference between it and the atlantic...but everything stands out as its own here. it's been breezy, almost chilly, which makes me feel right at home. and i may have brought the rain in ohio here with me. my body refuses to acknowledge that i'm in a new time zone or on vacation, so early los angeles mornings and i have become good friends. yesterday was shopping on melrose and a movie at the arclight. every time the hollywood sign was in view from the car i would squeal the worst squeals. this gal is a sucker for these sorts of things! i can't wait to share pictures with you next week. although, i think 90% of them are of palm trees. Now I want some In-n-Out. You already look like a California girl! :) Have a blast! P.S. 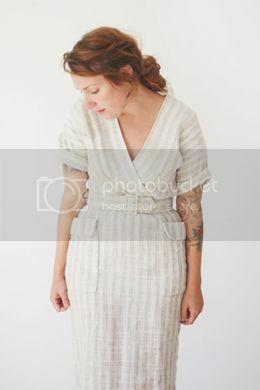 grabbed a button to put on my blog :-) so glad to have found your lovely blog! Sounds like you're livin' it up in proper West Coast style! omg In and Out burger is amazing - its ashame there are none in TN! aw i love these photos, can't wait to see what else you've snapped! You are too much cuteness! Glad you are enjoying the west coast and soaking it all up! That's the website, and you can get the address from there. It's the Museum of Jurassic Technology. Which maybe sounds boring or weird, but seriously, just GO there!! You will not be disappointed. It is one of the coolest places I have been. I don't want to say too much, because I think it's better to go into it knowing as little as possible. But basically, it is a museum full of weird things - many are real, some are not, but it's practically impossible to tell the difference! I love California so much. 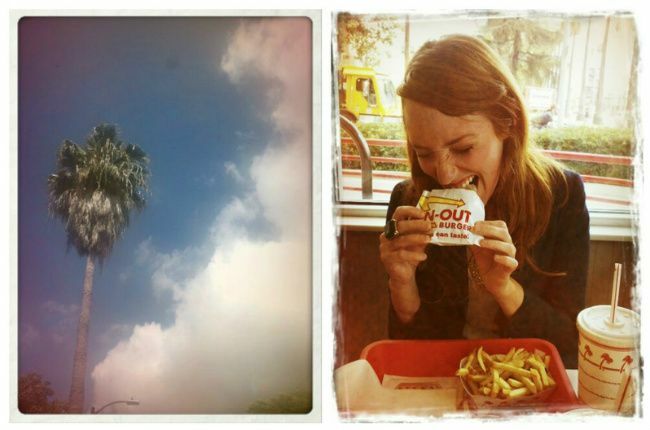 And In and Out is just something else...out of this world good. It's good to hear that you like California. Next time you should visit the northern areas and visit big foot. I love this state. Oh California is so wonderful! We lived in the Sacramento area for about 4 years and just loved it. In and Out is such an awesome place to eat!! Look forward to seeing your pictures!! So glad you're loving it here. And thank you for bringing the rain!!! happy travels to you! makes me miss my old stomping grounds BIG time! if I were yer tour guide I'd take you to the carousel at Griffith Park and then hop on the subway to downtown to see the Olvera Street, Chinatown and Grand Central Market...enjoy, enjoy! Ohmygoodness!! You're so close to me!! Next time, we need to get together. :) I've lived in Southern California my whole life, and seeing the Hollywood sign never ever gets old. It STILL makes me want to squeal - there's something magical about it. California looks like so much fun! I can't wait to get to go there. Oh! You're making me miss LA a little bit. I can't wait to make a trip down with my baby. Thanks again for the guest post! Yay! I'm happy to hear you are having a great time (its cool you are doing a lot of the things I did myself on my trips to LA) :) What an awesome place. I miss it very much. Have a fabulous rest of your trip!